Get yourself a cup of coffee, open a beer or pour two fingers of Scotch, neat, and settle into your favorite chair, it is going to be a long one. First things first, if you were hit by one of the hurricanes these past few weeks, I hope that you, your family and your home/business was spared or at least had minimal damage. Our thoughts and prayers are with you. I had a discussion recently with another ACA member and I told him that Malawi cichlids were still the most kept out of all. He claimed that Malawi cichlids had fallen out of favor and actually called me an “idiot”. I don’t know about you, but that didn’t set too well with me, especially from a Central American guy, and I set out to prove him wrong. Which, of course, he was. There was never a doubt! *Note that CA and SA cichlids are grouped together. So, as you can see, Malawi cichlids are still the most popular. It may seem crazy, but there is a movement out there with more and more people keeping these beasts. Years ago, you couldn’t give a Nimbochromis polystigma, fuscotaeniatus, livingstonii, linni or a N. venustus away, now, according to Dave Schumacher of Dave’s Rare Fish, they are flying out of his tanks at a steady pace. Exochochromis, Champsochromis, Buccochromis, the big and beautiful Fossochromis rostratus, too. All of these big Haps are suddenly popular as heck. Why? Could it be the promotion of these fish on FB and YouTube by our Publicity Chair, Jay Wilson? Could it be a thirst for something different? Or is it another reason like moon cycles and sun spots? Whatever it is, Predator Haps are popular now, more than ever. There is also a new trend towards big tanks. No, not 90s and 125s, those are puddles. I mean BIG tanks. 300-1200 gallons and more. You can also toss in the occasional pond in people’s basements, garages and fish rooms that make up 1000s of gallons. These big tanks are not just for Predator Haps but for Umbies and dovii, Cichla species and monster cats. As a matter of fact, Amazonas magazine recently had an entire issue devoted to the various Cichla species and how to keep and breed them. Oscars are experiencing a resurgence, too. I love Oscars! If you have ever kept them, you know what I mean, bundles of personality! So, if you are an Apistogramma keeper and think a 15 gallon tank is overkill, you are in for a surprise when you get outside of the world of dwarf cichlids and see what else is going on out there. And that goes for anyone who “specializes”, they lose sight of what is going in other aspects of the cichlid hobby. The annual BOT meeting voted to fund two out of four research proposals. Tiffany Atkinson: “Testing the Role of Turbidity and Diet on the Reproductive Traits of an African Cichlid Fish”. We look forward to seeing the results of these two projects in a future issue of BB. When I agreed to be Chair this year, I knew that I wanted to focus on a few things. One of them was Conservation, the other was a new membership structure that would help us be involved in more Conservation projects. The ACA is continuing its funding of the Madagascar Project which involves the captive breeding of all Madagascar cichlids to the tune of $3000 per year. We will be funding this effort into the foreseeable future, too. Thank you to all that have helped the ACA in its Conservation goals. By the way, Thank You to the Greater Chicago Cichlid Association that donated $1000 to both the Jordan and the Loiselle funds. Nice! The ACA is also looking at several other projects to get involved with. Jay Stauffer is no stranger to cichlidophiles and he will be possibly involved in a project of sustainable aquaculture in Lake Malawi. The people of the nation of Malawi are literally starving and are catching and eating anything out of the lake that they can. Soon, the fish populations could crash to levels that would lead to their extinction. That would be a terrible loss, not only to the hobby, but to future generations. Also, there may be a request to help pay for a current survey of the Rift Lakes. The local governments will not pay for these types of projects so it falls to you and I, and groups like the ACA, to pay for them. Conservation goals are great, the need is great and all of this costs money. We are also an Educational organization and we recently, yesterday as a matter of fact, received a proposal to help Project Piaba. I am looking into this and will get the information to you as it becomes available. Speaking of money and how to fund Conservation, Research and Educational Projects, I have formulated, and the BOT passed, the following Membership/Donation Structure. I want to especially thank our Treasurer, Tim Hovanec, who went down this road with me. I bent his ear and computer screen over several months’ time. 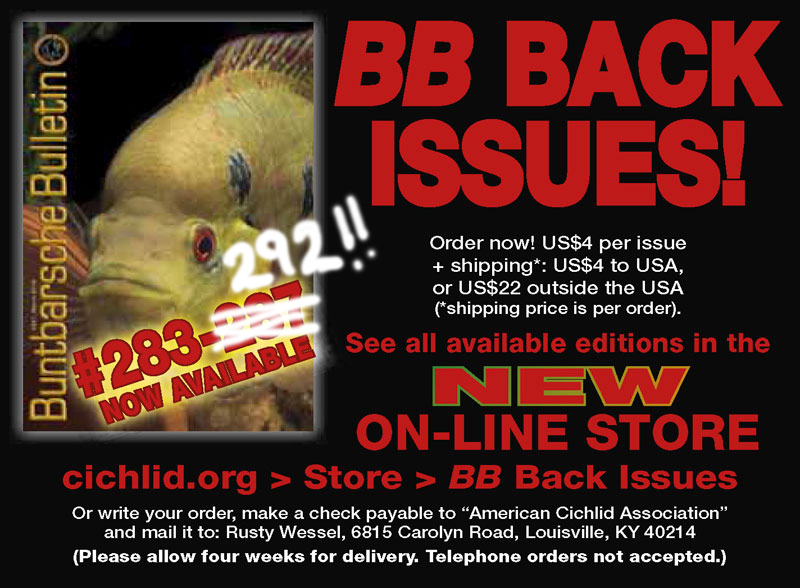 100% OF ALL DONATIONS AND MEMBERSHIPS TO THE AMERICAN CICHLID ASSOCIATION ARE TAX DEDUCTIBLE! Our 501.c.3 status as a charitable, educational organization allows this to be so. $35 Annual ACA Membership — nothing has changed. Life Memberships are back and there are various levels! You can build your membership levels incrementally and move up in rank. All memberships above the basic Life Membership will be published annually in an ACA publication to recognize your contributions to Conservation, Research and Education. $1000 LIFE Membership — All current LIFE Memberships are still honored, there will be no increase in your dues. This and all higher level memberships receive a Life Membership to the ACA. If you are a current Life Member, for example, a donation of $250 would bring you to the Patron level, $500 brings you to an Endowment level and so on. Chairman’s Circle — Individual donations of $5000 and above. You can also include the ACA in your estate plan as several members have already done. Please visit the link below. You can also remember the ACA in your Estate Planning as others have already done. 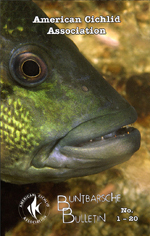 As time goes on, there will be much more need for cichlid conservation efforts. Use the link above for that, too. As BOT Chair, I see what goes on with the ACA financially, too. Let me tell you, it is a thin line of what comes in and what goes out. Yes, we have a core amount of money that is earning some interest but we use the interest gained to fund our research and conservation programs. The ACA tries to not use that principal, ever. So, with these additional funds from membership and donations, we hope to get more and more involved in doing great things for the hobby, for fish populations and for the people surrounding the watery worlds that our fishes come from. As I said at the beginning, it all takes money. The area near the hotel and convention center has been unaffected by the flooding that occurred, so you should have no qualms about scheduling time off to attend. Houston is making its way back to normalcy and the convention is definitely a GO! The ACA has finally joined PIJAC. If you didn’t know, our hobby is continually under fire from people who don’t understand what we do and want to end our enjoyable past-time, our conservation of endangered species and all of the good we do. If you are not aware, please visit the PIJAC web site and educate yourself. There are towns that do not allow dog sales. Yes, we all know about puppy mills, etc, but to ban all dog sales is nuts. There are many conscientious breeders producing high quality animals in a loving environment. So, get educated and become vocal in favor of the pet industry. As part of this educational effort, I encourage you to consider that the State of Hawai’i has just banned collecting of marine fishes. Even though the science says that the populations are sustainable and that the impact on the areas in question are positive, these “well-meaning” activists have won a small victory over what was a non-issue. The problem is that they will build on this one victory as it sets a precedent. These activists will chip away at the industry any way they can and they will gain momentum if not stopped. Did you ever wonder why the NRA fights everything that is anti-gun? Even though you think it makes some sense? It is because the anti 2nd Amendment side will use any precedent set to get our entire freedom taken away. It’s no longer simple, but a very convoluted road. Support your hobby and be vocal in that support! In light of recent controversies regarding the wild collection of aquarium fish, the American Cichlid Association (ACA) wishes to clarify the position of the organization on this subject. The ACA is an organization comprised of aquarists, scientists, educators, and conservationists. The ACA recognizes the need for both wild collection and aquaculture of fish for the aquarium hobby and research. Wild collection of fish is integral to ensuring genetic diversity in captive populations and promoting the introduction of new species and variants for the aquarium hobby and research. As an organization dedicated to conservation, the ACA, in line with the International Union for the Conservation of Nature (IUCN), recognizes the conservation and economic necessity of sustainable-use fishery resources. Fishing for aquarium species generates sustainable income for fishers and ensures incentive to conserve habitat required to sustain the fishery. It is the position of the ACA to support the continuation of sustainable aquarium fisheries worldwide, in addition to aquaculture. 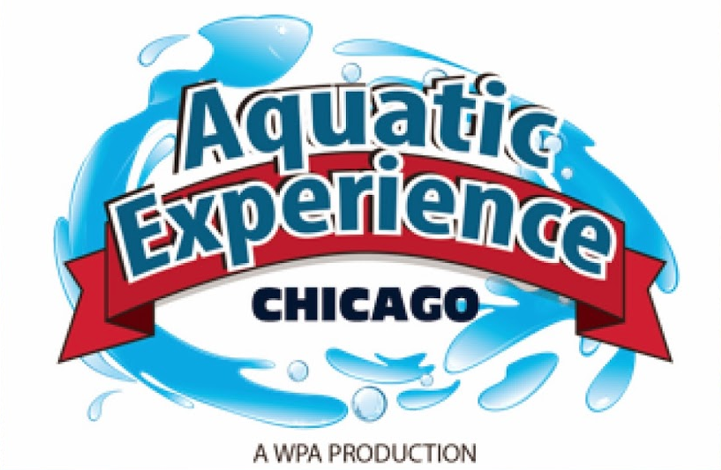 The American Cichlid Association Fish Competition takes place on November 3-5, 2017 as part of the Aquatic Experience-Chicago show, held at The Renaissance Schaumburg Convention Center Hotel, 1551 N Thoreau Dr, Schaumburg, Illinois 60173. All exhibit entries MUST be set up on Thursday, November 2, 2017 between 8:00am and 8:00pm only Judging Friday night 9 pm. $40 Best of Class 25 Classes will be available. I will be preparing a survey to be sent out to the membership. It has been a long time since we have done this so be ready for it. Sharpen your pencils and get ready to send us your feedback. Let’s make the ACA the best we can. If you have any questions about anything, please contact me at ACANEWSLTR@gmail.com I will not only send you a personal reply but I will also publish appropriate letters and Q&A in the next newsletter. Enjoy the soon to be coming, I hope, Fall weather. Stop by the ACA booth at the Aquatic Experience, too! BB submissions pay (or funds can be directed to Conservation/Research projects in your name)! Authors/photographers please contact the Editor at webslave@cichlids.org.au for details. You do not need to be an ACA member to submit material for publication. NB: ACA does not assume copyright of images, neither are they added to a database without permission. In the event that we desire to re-use an image in other projects, permission would be sought and supplementary payment is guaranteed. 1) Send payment(s) of $35 per gift membership to the ACA PayPal account at acapaypal@mac.com. sent money for a gift membership/s and the names and email addresses of the recipients. gift-giver, followed by email welcome letters from the ACA and CRC. Goto: cichlid.org > Community > Photo contest. Send your cichlid-related news/events to the AN Editor at ACANEWSLTR@gmail.com and we will be happy to spread the word for you. Allow six weeks lead time. Thank you. Check/edit your Contact Details on CRC yourself when you move or change your e-mail address. It’s so simple … try it. Simply go to smile.amazon.com, choose the American Cichlid Association as your charity and Amazon will donate 0.5% of each purchase to the ACA! It’s easy and basically free money. Please help spread the word. "The Search for the Holy Grail"